After all these years you would think I would be more comfortable with the degree of my own ignorance. Apparently not. 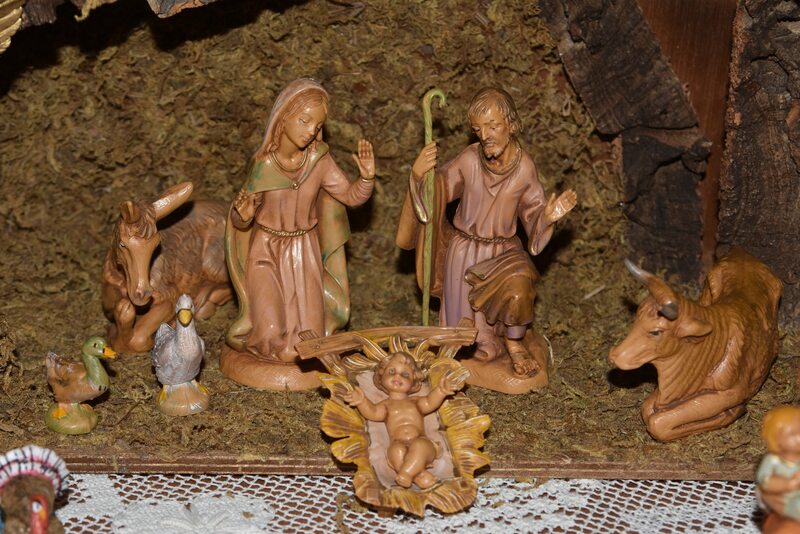 My wife has a small collection of nativity sets. One of her favourites is a collection by Fontanini inherited from my mother. Since this assortment is remarkably durable the grandchildren have always been invited to work with it, to move the figures around, to re-tell the story. (This week a (non-Fontanini) figure of a whale has been added to the set.) As well, with the birth of each grandchild a new character is added to the tableau. Somehow they become part of the story. But back to my ignorance. I overheard my wife telling the story again to our youngest grandchild. Apparently the open armed depiction of the infant is a fixture of many creche scenes. How could I never have noticed that before? Interesting that you describe the open arms of baby Jesus gesturing a hug. A week or so ago a minister friend of mine says the same thing about about Jesus hanging on the cross. Arnold, I’m not sure I would describe the open arms on the cross as a “hug;” perhaps welcoming all those who suffer, feel deserted or abandoned. Good to hear from you. Great post Keith! I love the language in the Story of the Holy Family! In fact, since becoming a “Godly Play” story teller, I am continually impressed and surprised at the simple, yet effective language that Jerome Berryman uses to illuminate abstract ideas naturally through the power of narrative. Often these ideas are difficult to grasp, even by adult standards. Perhaps I shouldn’t be surprised that children – and not adults – are able to access abstract ideas …”out of the mouths of babes” is testament to this truism… Perhaps it’s a case of the power of story, as it is the oldest form of human communication and one that continues to attract, inspire, and persuade today. Thanks Dennis. I too am a fan of much of the Godly Play language – simple and profound. I almost forgot! I love the (re)new(ed) blog. Keith Howard 2.0 ! Your exceptional ability to write, to tell stories, and to connect, is one of the best (if not the best) I have run across. Inspirational, personally touching, and intensely meaningful, are qualities that all story tellers wish to embody, and that you possess in spades. I am without doubt that you will “make it” in this new phase of life. Congrats! Thanks Dennis. The encouragement is much appreciated!